Obituary for Helen Foose | Lochstampfor Funeral Home, Inc.
Helen Margarette (Dum) Foose, age 96 of Landisburg was called home on Sunday, June 10, 2018 at the Claremont Nursing and Rehabilitation Home, Carlisle, PA.
Born April 22, 1922 in Elliottsburg, PA she was the daughter of the late James A. and Sara (Gray) Dum. On November 11, 1939 in Loysville she married her late husband Walter B. Foose. She was employed as a cook for the West Perry School District until her retirement. 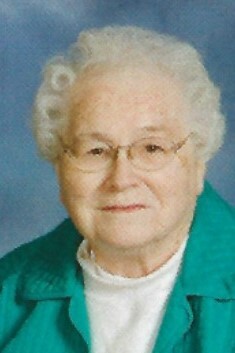 She was a member of Messiah Lutheran Church, Elliottsburg. In addition she was a member of New Bloomfield Senior Center; loved to quilt with church quilting group, former; member of Loysville Golden Age Club; Landisburg Fire Department and Ambulance Club and loved being a mother, grandmother and great grandmother. Helen is survived by two daughters, Betty Reisinger; Carol, wife of Carl Thomas; a son, Samuel, husband of Amy E. Foose and a daughter in law Louise Foose all of Landisburg, Pennsylvania; 12 grandchildren and 23 great grandchildren. She was preceded in death by three children Joan Louise Foose; Edward B. Foose; and Connie M. Warner; son in law John A. Reisinger; great grandson Josh Reisinger; four brothers and one sister. The family will receive friends on Thursday, June 14, 2018 from 9 A.M. to 11 A.M. in the Messiah Lutheran Church, 70 Limestone Ridge Rd, Elliottsburg, PA 17024 followed by a funeral service at 11 A.M. Rev. Carol Bowman officiating. Interment in Elliottsburg Cemetery, Elliottsburg, PA.